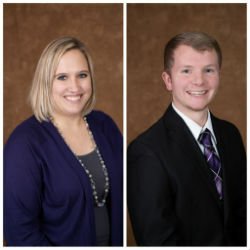 Lemmon, S.D.—Dacotah Bank in Lemmon has promoted Jaden Shockley to a business banker and recently hired Kori Dauwen as an agricultural banker. Jaden has been hired to serve the business community with all their financing needs. Kori’s primary responsibilities will be to assist existing and potential agricultural customers in their financial goals. “We are very pleased to be able to promote Jaden and to have hired Kori in the Lemmon market. They are both very familiar with the territory,” said Travis Ellison, market president. Shockley is a Lemmon high school graduate, class of May of 2013 and Dauwen with the class of 2002. Shockley also graduated in May of 2017 from Trinity Bible College in Ellendale, ND with two bachelor’s degrees in business administration and biblical studies. Dauwen graduated with a bachelor’s degree in business administration from North Dakota State University. Jaden is the son of TJ and Lisa Shockley, he has three brothers and one sister. In Jaden’s free time, he volunteers at the Turning Point Christian Center operating the video cameras during the Sunday services. He previously held a teller position with Dacotah Bank. Dauwen and her husband have 2 children and live in Lemmon. Kori serves on the Five Counties Nursing Home board and St. Mary’s Altar Society. She was previously employed by another financial institution in Lemmon. Shockley can be reached by phone at (605) 499-8279 or by email at jaden.shockley@dacotahbank.com. Dauwen can be reached by phone at (605) 374-3853 or by email at kori.dauwen@dacotahbank.com.